Baba Yaga is one of the most impressive figures in Russian folklore. An old woman with witch-like powers, she flies in a huge mortar, using the the pestle as a rudder, or sometimes on a broomstick. Sometimes she kidnaps children — or, lost in the woods or great field, they come upon her hut and never return home. One can hardly think of Baba Yaga without envisioning her spectacular hut. In folklore, it is often adorned with bones and little skulls. Standing on chicken legs, it spins when she is angry. Though some versions of this ambiguous and poetic story imply that Baba Yaga eats children, this detail never is clear; in some scholarly interpretations, she is seen as a source of great consolation. The children who find the hut are often bewildered and seeking her counsel. As in many fairy tales, the magical hut may be associated with a yearning for home or for comfort. Some linguists have noted that baba, the Slavic word for grandmother or old woman, may be related to the word for pelican, one of the great birds of legend. Returning to her nest to find her infants dead, the pelican pierces her own breast and revives them with her blood. It is not much of a leap to imagine that Baba Yaga spins her house out of grief. Or perhaps she flies with her little lantern to seek her lost children. It is unfortunate that the tale of Baba Yaga is not more widely known. How did you settle on the most important space of the fairy tale? We determined that the house on chicken legs was, however obvious, an opportunity for interpretation. Houses can’t really look like chickens, can they? So we thought about how one might make a structure or an architecture “chicken-like,” both externally and internally. When you were a child, was there any structure you encountered that reminded you of a fairy tale then, or does now? Can you describe it? There was a funhouse in Denver, Colorado, that petrified me. My parents have a photograph of me running out at light-speed. It was castle-like, if I remember correctly. My first recollection of the architecture of castles was therefore as a container of fear. What are the key elements of your architectural design and how is it sited? 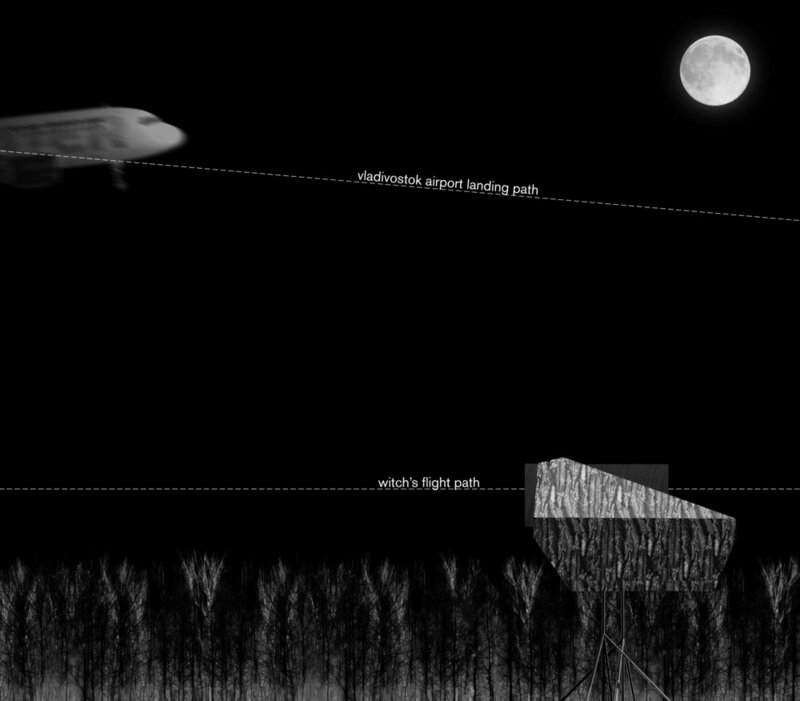 The house is located on a clearing along a major flight path to the Vladivostok airport. The white and red knights, signifying daytime and nighttime, are the airplanes that travel along this corridor at different times of day. The house, made from a thickly insulated steel frame, is wrapped in tree bark and bulges, like a chicken’s belly perched on a steel structure. A spinning turntable sitting on a large thrust bearing allows the house to spin and reorient itself. 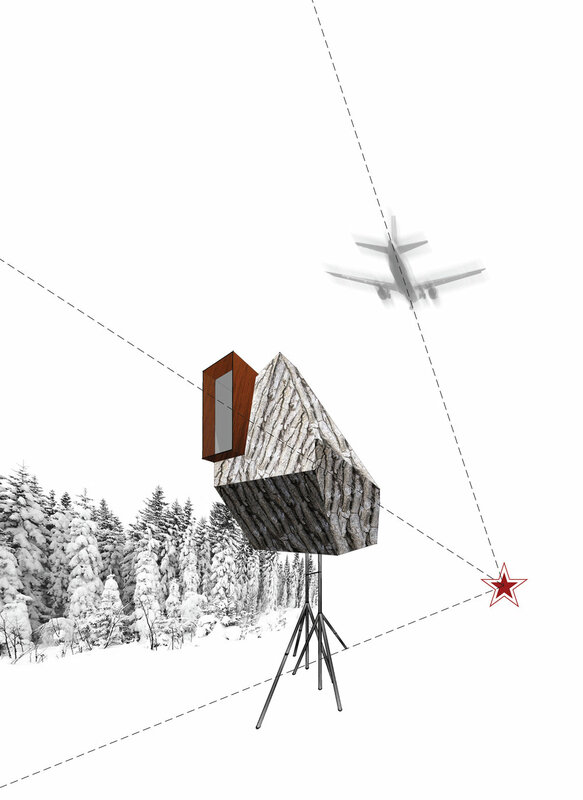 A large Corten steel box mimics the airplane landing path, and serves as the entry and exit point for Baba Yaga, whose broom rack sits within that space. A small, wood-burning stove occupies the main living area, compact but deformed. Scale isn’t just the space and objects within space. It can also be scale of emotion: loneliness, togetherness, despair and perseverance.